The words and hieroglyphs used by the Classic Maya, the Colonial Maya, and the modern Maya for the “Four Directions” have been a subject of interest for a long time. Lake Atitlan, in the Guatemala Highlands, surrounded by volcanoes and Maya people villages, has been included in the list of the Ten World’s Most Beautiful Lakes. 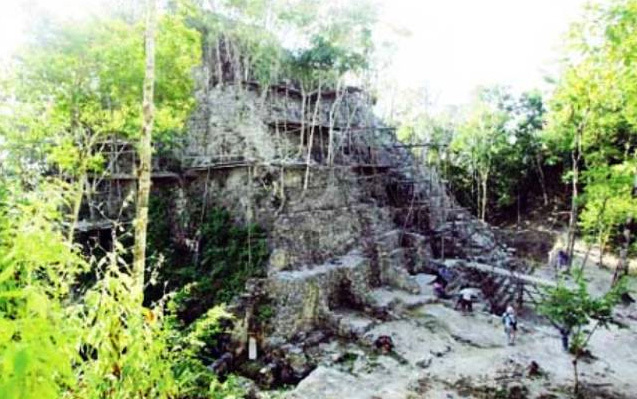 Archaeologist Carrasco Vargas and his team have been digging into 68 buried structures at Calakmul. They found a buried pyramid and dug a tunnel to inspect the interior and have found an area that had been remodeled many times over 600 years. And, in the process, have found many murals painted between 620-700 CE. 30 murals have been documented so far. They show the everyday life of the Maya and shed light on virtually unknown aspects of Maya society. There is a man with a big broad brimmed hat making maize gruel and another with an ornate headdress drinks from a bowl of the gruel. A female tamale vendor offers tamales to a man already eating some. There is a salt seller and a tobacco seller and a pottery seller. The paintings are described in a paper in the Proceedings of the National Academy of Sciences. The ancient Maya civilization — which ranged from the Yucatán Peninsula to Chiapas and Tabasco states, part of Veracruz state and as far south as Honduras — is well known for perfecting architectural techniques that produced towering cities, and for developing an advanced written language and creating books centuries before anything comparable appeared in Europe. The Maya also were gifted mathematicians who developed the concept of zero. And their astronomers, through centuries of patient observation, created a 365-day solar calendar that varies by less than 2 seconds from the one we use today — more accurate than what Cortés was using when he landed in 1519. Do you know that from the Ancient World, all great civilizations flourished in the template part of the planet north from the Tropic of Cancer with 2 exceptions: The Maya in the Middle of the Americas and the Angkor in South East Asia? The only 2 great civilizations from the Ancient World that boom in the Tropics. Both located at 15 degrees North from Equator. The heart of the Maya, 90 degrees west from Greenwich. The Angkor, 100 degrees east from Greenwich. Both reached an impressive level of development that collapsed and its remains where claimed back by the rainforest and rediscovered centuries later. Both regions are now divided in several countries that got involved in political struggles during the second half of the 20th Century. Both regions are now important destinations for the travelers interested in learning from this shared past. The Mirador Basin is as critical to Guatemala in the 21st century as the ancient cities of Nakbe, El Mirador, Wakna, Tintal, Xulnal, Paixban, and Naachtun were in the Maya world. As the only surviving rain forest area is protected and archaeological sites developed, the basin will be a magnet for academic research, education, conservation, and economic opportunities for surrounding communities. The development of the needed domestic infrastructure to service the requirements of both academic interests and international tourism will provide Guatemala with an economic self-sustaining annuity. Dr. Richard Hansen and the Mirador Basin Project (formerly known as the Regional Archaeological Investigation of the Northern Petén, Guatemala) continue to work in the basin in close collaboration with the government of Guatemala. This team has the capability and vision to make the Mirador Basin a reality for world-class tourism benefits. Guatemala is twice blessed. Its historical and cultural heritage is rooted in one of the greatest civilizations on the planet. The diverse physical resources include an area of virgin rainforest. Guatemala now stands at a crossroad. We must actively seek to help protect, preserve, and develop these great resources, because they are irreplaceable. The Department of Petén is unique. Archaeological investigations have just scratched the surface. The greatest discoveries are yet to be made. Eco-tourism and community education will allow Guatemala to share its many resources and its heritage with the world. The Mirador Basin preserve is a path to greater scientific and environmental progress, economic growth, and international prestige.